So you have been invited to some of the most awesome parties of the holiday season - AWESOME! But don't make the terrible mistake of coming to a great party empty handed. Hostess gift giving has not gone out of fashion and is still a wonderful way of thanking the host for putting on a great party. 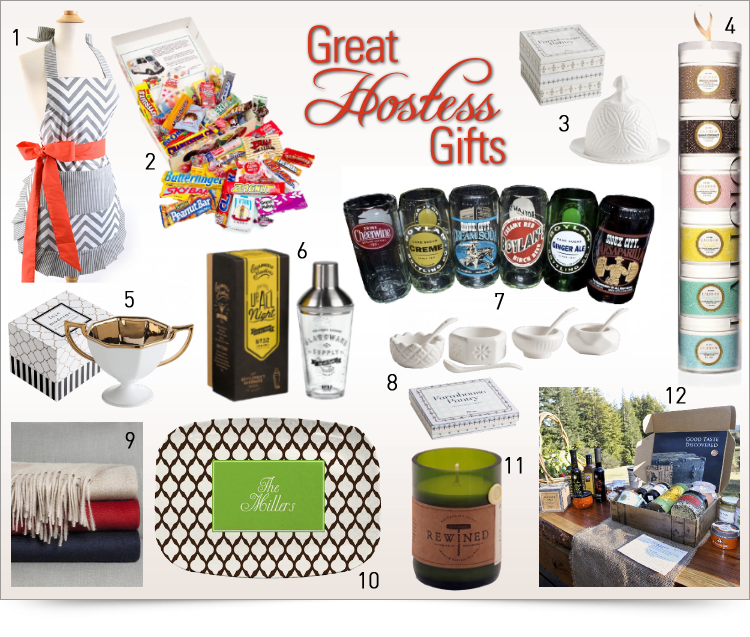 That's why BOOMbox Network has partnered with me to sponsor the following holiday gift guide (which contains affiliate links) listing 12 stylish hostess gifts that will make sure you are still on the guest lists for next year's holiday parties. Flirty Aprons - An apron (especially a pretty one like this one) is a gift that you know will come in handy over the busy holiday season. Order your apron & see the other choices here. Decade candy box - Bring your host or hostess back to their childhood by choosing a Thank You box with candy from the decade of your choice. Perhaps they'll share so that you can reminisce together. Choose your decade here. Covered cheese dish - An adorable white porcelain cheese dish that can come out every time your hostess entertains. Buy it here. Sugar scrub tower - A beautiful assortment of 6 different sugar scrubs for the hostess to pamper herself once all the guests have left. Find this gift idea by Lalicious here. Gilded trophy bowl - Very simply, a beautiful and elegant vessel to place anywhere in the home and use as wished. Find it here, along with other fab gift ideas from Pure Home. Glass cocktail shaker - Cocktail season is upon us. You want your hosts to be ready! Add a bottle of hooch and mixers if you wish to go all out. Buy the cocktail shaker here. Reclaimed soda bottle glasses - For your stylin' eco-conscious hosts, they will be sure to enjoy these glasses made from real glass soda bottles. Find the reclaimed glasses here. Salt & pepper cellars - A wonderful and pretty hostess gift that will certainly make its way on to the next dinner table. Buy here. Cashmere throw - If you're a house guest for a few days, a luxurious gift that the host might not buy themselves will fit the bill. Like this cashmere throw. Cozy too. See it here. Custom serving platter - Personalized gifts are the best. They demonstrate that you went the extra step and put some thought into the gift. Like this platter with the host's family's last name (or other inscription). Order it here. Re-wined candles - A clever way to reclaim old wine bottles: as jar vessels filled with natural soy wax that has been carefully blended with aromas of white grape, honey, freshly baked bread and a spritz of citrus. Buy it here. Taste Trunk's monthly foodie subscription - Chances are that if your hosts invited you for dinner, they like to cook. In which case, they will really appreciate a single or even a monthly subscription to Taste Trunk, a box subscription service for foodies. Find out more. Which of these stylish hostess gifts are your favorite?